Two years after Apple launched its first wearable, the company has pulled the dust sheets from the second generation of its watch. It's certainly not what's on the outside that defines the Apple Watch Series 2, which looks the same as its immediate predecessor. The headline feature is that the device is water resistant to depths of 50 meters and can be used to track the activity of swimmers. The second standout upgrade is the addition of built-in GPS, which the company promises won't make you wait around like other GPS watches. The company has entirely redesigned the watch for its second series, adding in a dual-core processor and better graphics that are twice as fast as the original. The device is smart enough to produce visuals at 60 frames per second, and the company's Jeff Williams says that it has the brightest display Apple has ever shipped. At over 1,000 nits, it should deal with many of the hurdles that come with using an LCD-based device in bright sunlight. Apple is adding another case material for the second-generation watch, with a ceramic housing now available. The company has also partnered with Hermès and Nike to produce brand-specific editions of the wearable. The elegantly named Apple Watch Series 2 Nike+ Edition has a custom band that looks much like one of the sneaker firm's old Nike+ SportsWatch GPS running devices. Despite being an early pioneer, Nike withdrew from the wearables market a few years back -- a decision that makes more sense in hindsight. Back in August, analyst Ming-Chi Kuo released the first in a long series of reports claiming inside knowledge of what Apple was cooking. At the time he said that the second-generation watch would gain faster internals, GPS, a barometer, better waterproofing and a bigger battery. As the event itself has shown, he was pretty much on the ball, which makes a mockery of Tim Cook's historic promise to "double down on secrecy." The fact that the Apple Watch comes from the world's most famous technology company means that the device has come under a lot of scrutiny. Plenty has been written about how the unit serves as an indictment of Tim Cook's leadership, but that doesn't seem to match the reality. The watch tops the quarterly smartwatch sales charts, and it isn't too far away from Fitbit in the overall wearables market. Fitbit, of course, produces significantly more devices at a wider variety of prices, so that's saying a lot. For a device that's been called a flop on more than one occasion, it's certainly not behaving like one. At today's event, Apple revealed that it is now the second biggest watch brand in the world and the first in the smartwatch world. The Apple Watch Series 2 will launch on Sept. 16th, and prices for the device will start at $369 for the 38mm edition. 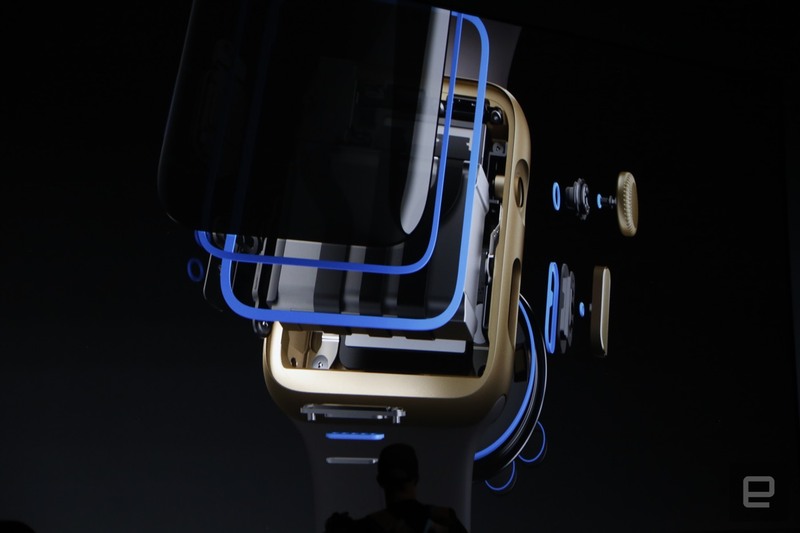 The Nike+ Edition of the device will also start at $369 but won't begin shipping until late October. Of course, if you have a Series 2 you must also have a Series 1, and the original Apple Watch has been retitled to meet the new naming scheme. The company will keep the OG device around as an entry-level option, with prices starting at $269, but you will also get the new CPU inside. Click here to catch all the latest news from the Apple's "See You" event.